It’s October already! We all hated to see our beautiful and hot summer end, but you’ve got to admit that autumn in the PNW is a beautiful time of year. The cooler mornings with warm afternoons are invigorating and the fall leaf color this year is just spectacular. We all loved our lush summer gardens and while many of our summer-loving flowers have died out it is still possible to have an interesting and beautiful yard with well thought out fall plantings. Planning carefully for year-round interest in your landscaping can really enhance the curb appeal of home and your pride of ownership. We have some really great options for autumn color planting here in the PNW. 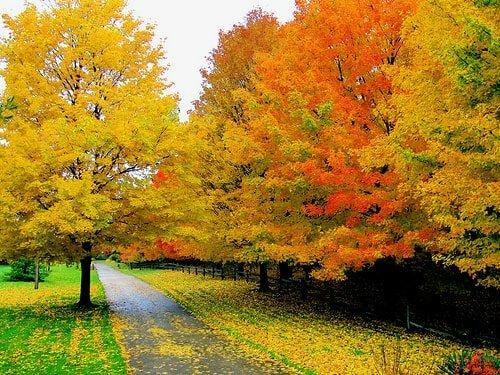 Trees – Red Maples grow well in our climate and have gorgeous fall foliage. Maple tree varieties such as Red Sunset, October Glory, Brandywine, Sun Valley, Vine and Japanese offer orange-red fall color. The Chanticleer Pear is a great tree for smaller spaces because of its narrow, vertical growth and it showcases brilliant shades of orange-red to purple and holds its color later into the season than other deciduous trees. For bright golden yellow hues try the Autumn Gold variety of gingko. The Katsura turns shades of apricot, yellow and purple in the fall and the autumn leaves sometimes give off a “brown sugar” scent. The Stewartia’s deep green leaves turn blazing red, yellow and purple in the fall and it has an exfoliating bark in shades of orange and grey that lends interest even after the leaves are gone. Bushes and Shrubs – Red-twig dogwood has outstanding bright red stems that offer a bright pop of color during our grey winter days. Burning bush has exceptional, blazing red foliage in the fall that is a stand out in the landscape. For beautiful fragrance and color Witch Hazel is a great choice. Its bright yellow leaves are followed in late fall by flowers that smell of spice. There are also some wonderful flowers and smaller plants that offer year round interest that can be found in local nurseries. We would love to help you create a beautiful landscape you can enjoy year round. Just contact Aadams Tree & Landscaping or call us at (425) 844-9923 to set up a complimentary consultation for landscaping. Our Kirkland and Woodinville experts will be happy to help you plan beautiful surroundings that will give you delight through each season of the year.